I currently have so much to say that none of it will come out. You ever feel like you have so much to do that it makes it hard to do any one thing? You become immobilized? Yes? Well, that’s me this week. I just wrote a whole post on the myth of having it all and realized it was more Debbie Downer than I want to be today. So it’s not getting posted. If you would like to hear me ramble about how elusive this myth is, let me know in the notes below and perhaps I’ll post…I like to keep things lighter around here because damn, sometimes life is hard. Let’s talk about something that always makes me happy: cookies. Better than just cookies are these cookies that are chewy, spiced and loaded with granola and cherries. I love it when I come across something that inspires. Chai granola is my current muse. The spices and texture instantly warm up and add personality to everything they touch. I fell hard in-love with Chai-Spiced Granola. The first thing I shoved it in was waffles…I swear that recipe is coming soon. Then I put it in cookies. These cookies. I knew I wanted brown butter for caramel notes. Granola for crunch. Cherries for sweetness and oatmeal for heartiness. Let’s eat cookies and not worry about anything on our to-do list today. How’s that sound? GRANOLA. I used my chai-spiced granola. 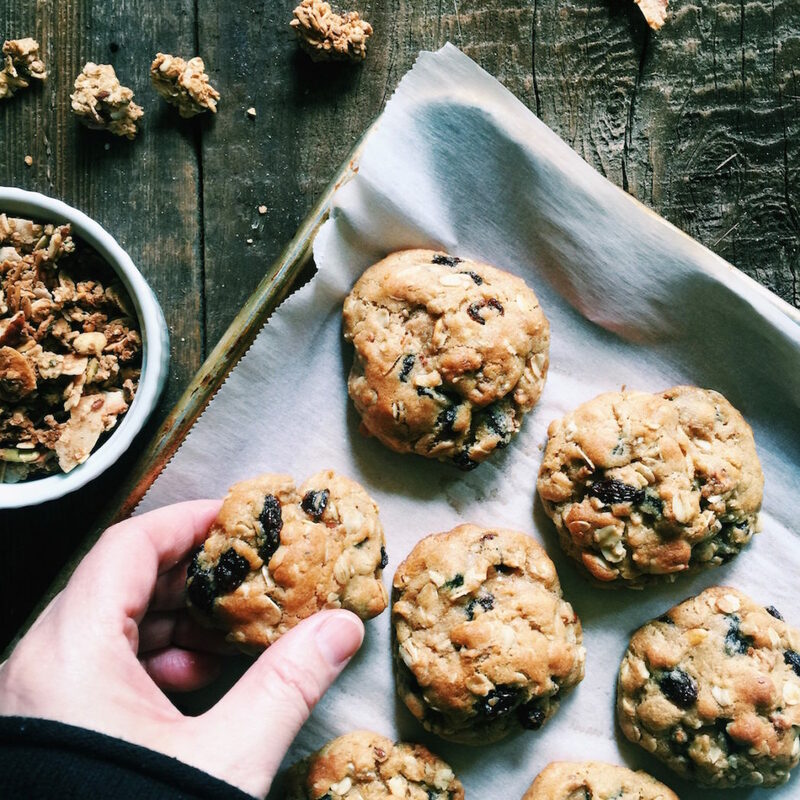 But heck, if you don’t feel like making homemade granola I don’t want that to stop you from making these cookies. 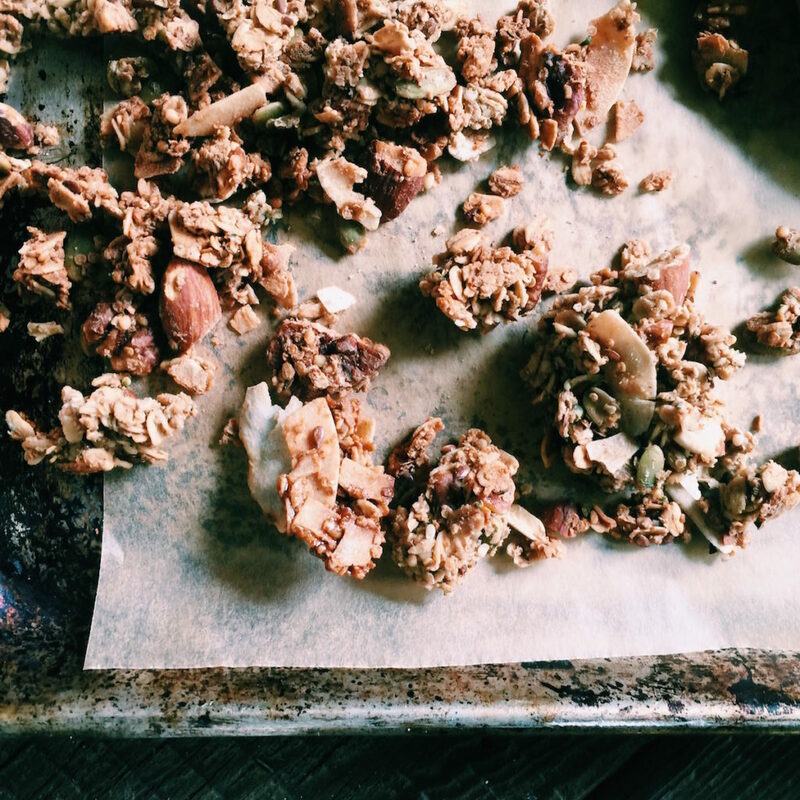 Use what you have on hand or whatever your favorite granola is. I will say, that homemade granola tends to have smaller clumps…big clumps will have a harder time settling into a cookie…just keep that in mind when picking your granola. OIL. I love Sunflower Seed Oil. It’s so mild. It’s my favorite for salad dressings as well. But use any neutral-tasting oil that floats your boat. BROWN SUGAR. I tested these with light brown sugar and I made them with dark muscovado sugar. Both totally worked for me…although the muscovado gives more personality. Go with whatever flavor is calling you. FLOUR. I love to put white whole-wheat flour in cookies. It gives them this certain fluffiness that I love. However, in this cookie, it made them too dense so I went with all bread flour. If you want more fiber in your cookie, split the flour 50-50, 1 cup of bread flour and 1 cup of white whole-wheat flour. I have not made this cookie with all-purpose flour, because I’m just a complete believer in the chewiness that bread flour gives a cookie. So proceed with that in mind if you use all-purpose flour. BAKING. I like these best when they’re slightly under-baked and left to cool on the cookie sheet. When baked to the point of looking completely done, they ended up too baked for my taste. Add the sunflower seed oil, muscovado (or brown) sugar, granulated sugar, vanilla and eggs to the browned butter once it has slightly cooled. Whisk together until thoroughly blended. It will be thick and sludge like. Break up any large chunks of the muscovado if using. In a medium-size bowl, whisk together the bread flour, baking soda, baking powder, cinnamon, nutmeg, cardamom, ginger and salt. Pour the flour mixture into the butter mixture. Throw in the oats, granola and dried cherries. Stir until just combined. I almost always have you throw your cookie dough in the fridge at this point…not necessary with this dough. Yay! Cookies sooner! Gently roll about 2 tablespoons of dough into a nice ball. Don’t get crazy and futz with the dough too much, but make sure you have a nice little sphere and place on the baking sheet. Make sure there are about 2 inches between each dough ball, allowing space for spreading whilst baking. Place the baking sheet with the coated dough balls in the freezer for 10 minutes. You can skip this step…it will just help them hold their shape whilst they cook. Put the cookies in the oven for 11 minutes. I strongly urge you to cook one sheet of cookies at a time. If you really want to bake two sheets together, I suggest that you rotate the sheets top to bottom and front to back mid-way through the baking time. You want them to come out of the oven when they look just barely cooked. Let them cool on the cookie sheet for 10 minutes (or until the cookies have set) and then let the cookies finish cooling on a cooling rack. You guys, I’m on SnapChat. I’m not sure what I think about it. Well, maybe I am. I think it’s weird. And awkward. I’m constantly getting cut off…and it’s hard to shove anything of value in such a short time span. And you have to do the one thing that I am most challenged with: remember what I was saying. All that said, I hope you’ll join me. My name is displacedtaitai…displacedhousewife was too long. I’ve already signed up to do some FeedFeed takeovers, so stay tuned. More cardamom recipes: brown butter muscovado snickerdoodles. Make these, memorize them, add them to your cookie repertoire. 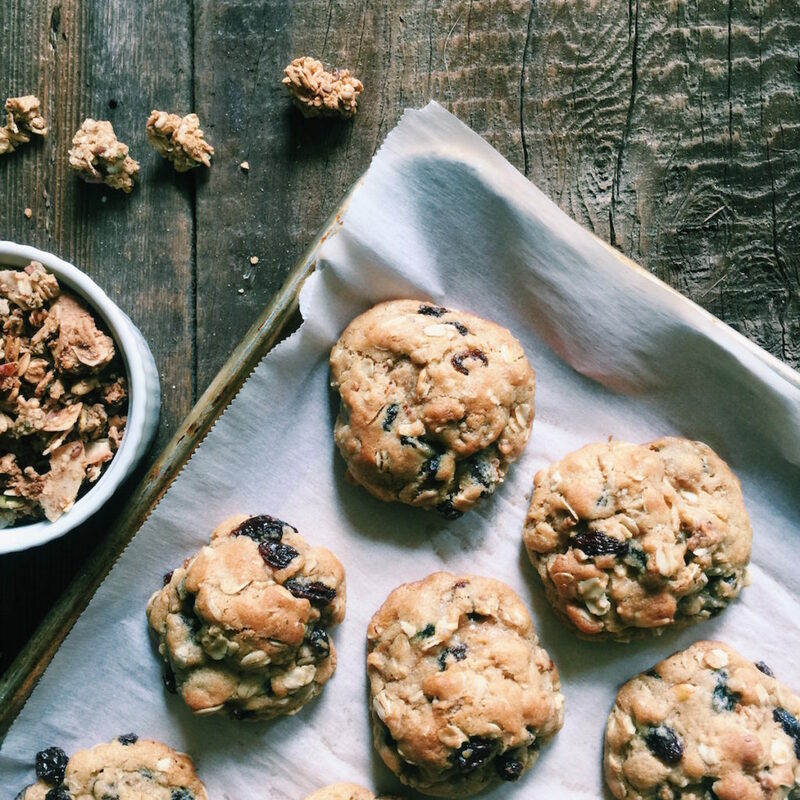 Chai Spiced Granola…yup, hope your headed over to make this right now so that you can make these cookies. I made one test batch of these cookies with dark muscovado sugar. Stella said, ‘these taste like there’s muscovado in there.’ Dazzled with her palate. Yay people! The Hatchery is giving a special offer for DisplacedHousewife followers. Sounds a bit cult-like, but we’ll take it. Either click here or on the banner above, use the coupon code DHW10 and get your first Hatchery box for $10. Recently on DisplacedHousewife: Chai-Spiced Granola, Thai Noodle Salad, Chocolate Rye Stout Cake + Marshmallow Whiskey Meringue, Tart Cherry Almond Scones, Harissa Sliders with Feta-Harissa Secret Sauce, and Brown Butter Muscovado Snickerdoodles. 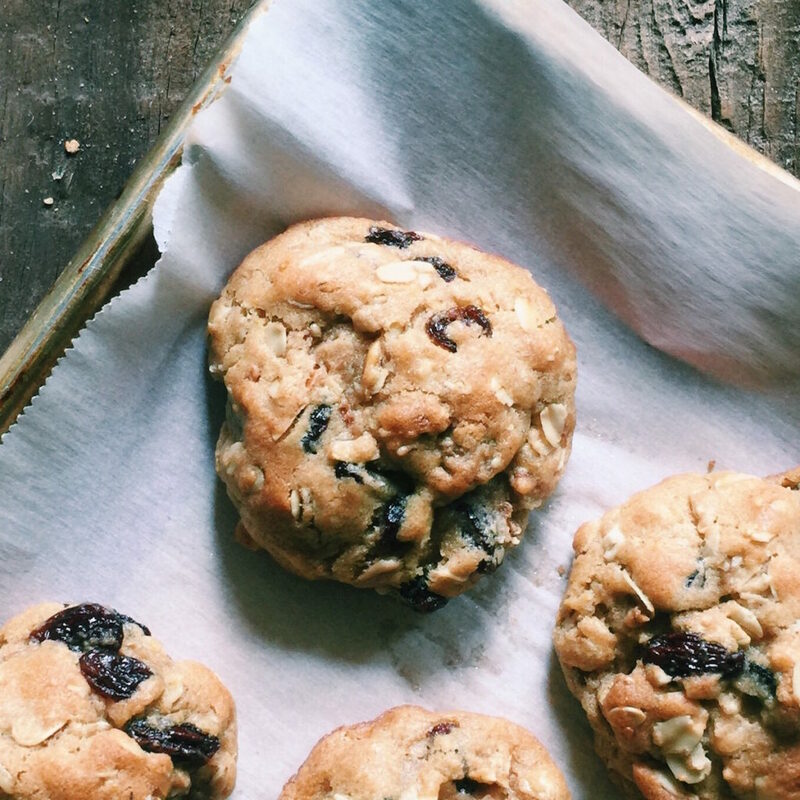 It’s coffee o’clock over here and all I need is a granola cookie (ok make it two!) to go with :). OK, I totally get that life is hard, but how hard could it be with a warm plate of these cookies to cheer you up? :) They look amazing!! Hang in there… trust me, I know the “can’t have it all” thing. I console myself by saying: “you can have it all, just not all at once.” But I’ve never been a particularly patient person… :) I wonder how these cookies would be with my Chocolate Granola with Mexican Spices? I may have to give it a try… tonight! Happy Monday Rebecca! OMG Rebecca! I want to grab like a dozen of these right off your baking sheet! They look sooo good! Anything with granola, count me in! And your chai spiced granola…even better! Have a great week!